Nearly everyone who appears on CNBC is primarily concerned with one thing: Seeming like an authority on their particular sector of the market. They make their calls with as much confidence, poise, and well-spoken soothsaying as they can. That they’re usually wrong, often dramatically so, is beside the point. You’re watching them. They’re getting more famous. CNBC is selling advertisers time at a higher rate because you’re going to be there the next time they cut away from whichever talking head happens to be on at the moment and someone else tries to hawk you a payday loan or subprime mortgage. The Fed is the same. They put our voluminous minutes and reports that are intentionally confusing, misleading, and verbose. Reams of paper and fancy talk designed to back up what is at best total guesswork that routinely misses the mark worse than a trained monkey could. Which begs the question: Is it not just guesswork, but instead, intentionally misleading propaganda designed to get you to believe the economy is stronger than it really is? 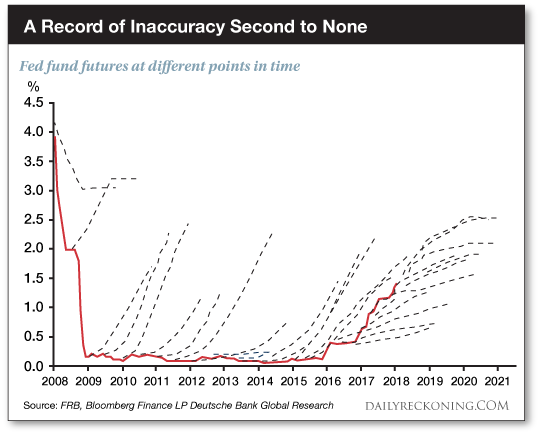 Professional forecasters are worse than trained monkeys at predicting markets. This chart shows the implied path of Fed interest rate hikes from 2008 to 2021 based on Fed Funds futures contracts traded on the Chicago Mercantile Exchange. Every year, the Federal Reserve forecasts economic growth on a one-year forward basis. In 2010, they forecast 2011; in 2011 they forecast 2012, and so on. From 2009 to 2016, the Fed was wrong eight years in a row. When I say “wrong” I mean by orders of magnitude. The Fed would forecast 3.5% growth and it would come in at 2.2%. That’s not even close considering that growth is confined to plus or minus 4% in the vast majority of years. Let’s not be too hard on the Fed. The IMF forecasts were just as bad.